I really enjoyed your site. It is hard to find good information, as you state, from manufacturer’s websites. Consumer reviews are almost worthless. The reason I write is that I am about to buy an inswing vault door. I looked at Brown, but they are out of my budget. I am currently looking at Graffunder and Amsec doors, both with half inch steel. The Graffunder is twice the price of the Amsec. I would appreciate some unbiased opinion as to whether the Graffunder is worth the added cost. This is going to be a one time deal so I really want to get it right. This vault will be made of B rated panels. It is residential and will be used for security, safe room, fire resistant room and tornado shelter. Thanks so much for all the thought and effort you put into your site. It is the best that I have seen in my hours of searches. My wife prefers the Amsec; well, actually, she prefers its price. Thank you for the kind words about my site. It was a lot of work researching and writing it all! I’m glad you’re finding it useful. Congratulations on putting together such a serious vault. The steel inner plates are an impressive addition. I took a look at the Graffunder and AMSEC vault doors. The Graffunder Series-V B-Rate with 1/2″ outer steel is probably the one you priced. It looks like AMSEC has two flavors, the 1/4″ outer VD803xSF and 1/2″ outer VD803xBF. I’m assuming you’re comparing Graffunder prices to the BF version, but there’s only about a 10% (~$500) list price difference between the SF and BF anyway. That’s very interesting that for identical steel thicknesses the Graffunder costs 2X more than the AMSEC. My first thought was that maybe the Graffunder has manganese (torch-resistant) steel, but their website says it’s standard A-36 plate steel. One clue may be in the weight difference. The Graffunder VB7834 for a 78″ x 34″ rough opening is listed at 1,300 lbs. The AMSEC VD8036BF fits a larger 79.5″ x 35.5″ opening, but weighs only 990 lbs crated up. Since steel is the heaviest and most expensive material in a safe, I’m guessing the Graffunder door frame and maybe bolt carriage have much more steel than AMSEC’s. If you look at the Graffunder safe cutaways, they use nothing but thick bar steel and full-length welds in the frame and bolt carriage. The additional cost of the steel and then the labor to full-length weld it all together may account for the price difference. Beyond my speculation, I’m afraid I can’t give you a definitive answer. Calling the manufactures (especially AMSEC) is probably a waste of time. I’d recommend asking a SAVTA safe dealer that sells both. Depending on your budget, the AMSEC may offer more bang for the buck when you consider the incremental security of the higher price tag. After all, you could buy two whole doors for the price of the other. But then again like you said, you only want to have to do this once. If you get a definitive answer, please let me know! I found another dealer for Graffunder which will sell the Graffunder for $5550 plus freight and “handling”. I am waiting to hear back from him about the freight and handling. This is a safe room and I need a digital lock to get in quickly. Digital locks fail more often than mechanical. If the lock fails I have to pay to have it drilled. I understand that digital locks do not, many time, fail suddenly, and that sometimes you can replace them when they get “flaky”. If so, this may not be a huge issue. I guess I am leaning toward the Graffunder. Any further thoughts? Glad to hear my guess about the Graffunder/AMSEC wasn’t too far off! I agree about the parallel locks, I’d want both too. Even if they don’t offer dual locks from the factory, sometimes you can have a second lock added by a safe technician. It’s worth asking. If you’re worried about lockouts/reliability, another option would be to just assume the electronic lock will wear out every 5 years or so and replace it. Decent quality replacement locks retail for about $100/ea; if you’re handy and careful, you can replace it yourself. 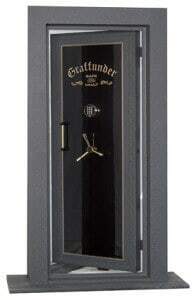 Graffunder recommends having a safe tech come every 5 years and lubricate and adjust the door anyway, so you can also have him replace the lock while he’s at it. Thanks for your thoughts on the dual locks. I have really been ruminating over the door but I think I will likely go with the AMSEC. It is hard to justify the Graffunder. Also, their dual lock setups require, as I think I mentioned, one to open both to enter. Because of this the failure rates are additive. Does not seem a smart solution. This would also also not be a good setup for a panic room. I find safe technology fascinating. A lot of smart people have thought a lot about this. What are your thoughts on the Vault Pro vault doors?